Kids are adorable and fun and sweet and cute and perfect. Yeah, not all the time. There are times that they throw the Mother of All Tantrums (in the middle of the grocery store)… they get physical with another child (hitting, pushing or biting)… they get a mouthy with Mom and Dad (unheard of, right? )… they display naughty behavior at school (talking too much, can’t keep hands to themselves), or they just simply don’t listen or do what they’re told to do. What’s a parent to do in terms of discipline to keep their kids on track for becoming respectful adults? Take my kid, for example. He’s a wonderful kid. He’s smart and athletic and talented. He’s at an age (almost 11) where we tell him to brush his teeth, comb his hair and put deodorant on, and 45 minutes later the teeth are finally brushed but he’s forgotten his hair and deodorant. Obligatory chores like taking the trash out are met with heavy sighs and rolled eyes (even though he knows that he won’t get any allowance if he displays those behaviors). And God forbid we organize a family outing without checking with him first. We have many, many discussions about how we are the parents… and we make the decisions for our family… and he’s just lucky to be a part of it all. As our boy approaches Middle School, we are trying to give him a little more freedom to roam around the neighborhood with friends. Yesterday, he had permission to head to one spot in the neighborhood. A little while later we discovered that he had left that spot and went to another location a little further away in which he did not have permission to do. As parents, my husband and I had to come up with a proper consequence for this poor decision of his. 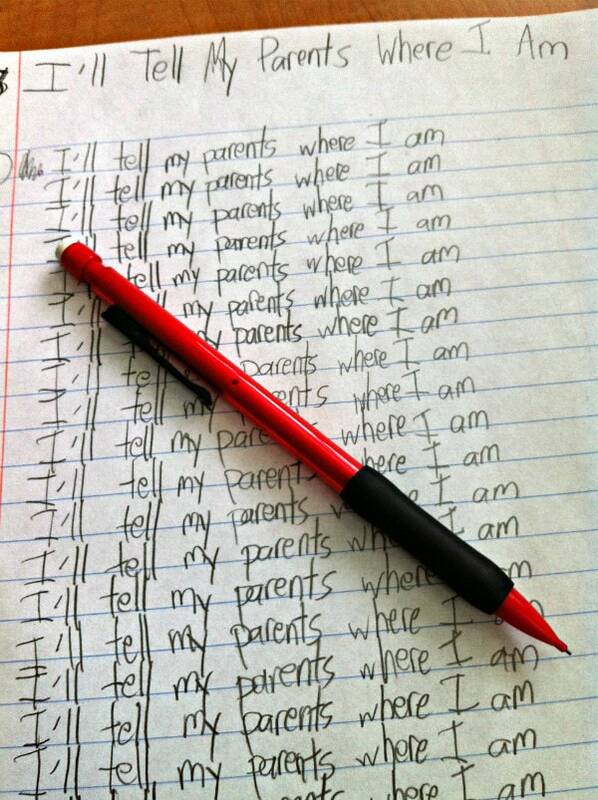 After a very lengthy discussion with our son about safety and worrying, etc., we decided to go Old-School on this one and have him write “I’ll tell my parents where I am.” 100 times. He looked at us a little funny and then got to work. After writing a full page of 30 sentences, he lamented how difficult this task was. We told him it was a good reminder for him… that he was doing this because of the poor choice he made. I believe he got the message. We could have taken away video games instead, but we didn’t feel he would have gotten the point that we were trying to make with a consequence like that. 1. Be consistent with rules and consequences. If parents don’t stick to the rules and consequences they set up, their kids aren’t likely to either. If your child is grounded for a week, don’t let those sad eyes and sweet smile talk you into shortening that week into just a couple of days. If you’ve told them it’s a week, make it a whole week. 2. Parents need to work as a team. Whatever you decide, it’s important that parents are on the SAME PAGE when it comes to discipline. Mom shouldn’t be the softie and Dad the overbearing one (or vice versa). And you definitely shouldn’t argue about how to discipline your child– in front of your child. 3. Give warnings when you can. If you can see that your child is going down a path toward inappropriate behavior, alert them that their behavior is unacceptable to you. Give them the chance to turn their behavior around before you begin delivering consequences. Praise good behavior and do your best to model good behavior for your children. This parenting thing isn’t always so easy, but our kids look to us to learn how to behave. Parents who behave badly… well, you know where I’m going with that one. Please share any secrets you have for effective discipline/consequences for your own kids… we need all the help we can get! Am I Too Tough When Disciplining my Kids? What to Do When You Disagree on Discipline? Should You Punish Your Child? *photo credit to that first photo- though it’s all over the internet, so not sure of the origin. My 10 year old has shown some aggression at school. She slapped a boy on the bus 2 months ago (we took tech away for a week, had her research ways to control anger, and writ an apology letter to the boy and the bus driver) Today she came home, in trouble for kicking and pushing. I’m at a loss for how to punish her. We have used the sentence writing before but mostly with our younger 2 children. Any ideas?? I would suggest speaking to the counselor at her school to see if she has some suggestions… I’m sure there are people out there who work with kids on anger management. Daughter is 13 and is on her phone way to much and i domt know a punishment ?? Any ideas ?? I am down with the old school approach but how many sentences is appropriate for a 7 year old. We have 3 boys and 2 girls. DS9 just hit tweendom and I’ve had to really change the way I deal with his behavior. I have each typical behavior and punishment on a paper so DH and I are on the same page even when we’re upset. Push, hit or kick; 3 days grounded and writing “I will keep my hands to myself.” Cursing, yelling or being rude: 10min standing in a corner. Incomplete homework: Dishes without help. Chores not done: no TV for 2 days. Bad Bus Behavior: Stand with mom away from friends until the bus comes for a week. This is new so I’m not sure if it will work, but I don’t know what else to do. My daughter has been telling small lies. Nothing major but just enough to upset us. So after the grounding and taking away the games nothing worked. I called the county sheriff. I think he got the point acrossed that lying is not good and can land you in trouble. Now she tells people how uncool it is to lie and where kids go that lie all the time. Looks like you found a good solution! I have been making my daughter write sentences for over a year, and it is punishment for all types of actions. She sometimes gets smart mouthy about it or rolls her eyes, and I just add another set of sentences. I don’t look at them while she is writing, but I do review them all once she’s done. If there are an that are incorrect or sloppy, I make her do those again. Then the pages are dated and hung on the refrigerator so she sees them every time she goes in the fridge. There was one night she kept being ugly about her punishment, and ended up with 4 pages of sentences… It took her 2 days, but I didn’t have to deal with her being sassy again for a while. Sending kids to their room does nothing, unless you can watch them the entire time. There is simply, always something there for them to play with, meaning they don’t get the punishment part. Today was not a good day. I had to go to Sprint to have my phone worked on, and of course, they start acting like crazy monkeys as soon as we walked in th door. This afternoon, when we returned home, I completely ignored them, responding only to necessary communication. When one asked why I wouldn’t listen to them, I reminded her how many times I had spoken to them in that store and they had completely ignored me, and how those actions can works both ways. Needless to say, she got really upset, but I think she got the point. Thanks for sharing your experience too! What a fantastic article, thanks for sharing! I love the “Old School” punishment too. I think in today’s times we so rarely have to physically write something with our hands anymore. If you are out of school that is. Thanks for the great suggestions. Simple and straight forward and a nice reminder and I love the contract idea and the walkie talkie – they are filed away for my two when they come to that age (mine are 4 and 7)…if we need them of course!! Sounds like your son is exactly like my 10 year old! I’ve been so hesitant to allow the freedom to go on his own around the neighborhood on his bike, so my husband allowed him to do it with a walkie talkie… this way we could get in contact at any moment. That has worked out well and he can tell us if he’s changing his path so we know how to find him. As for punishments, we try to be consistent – and I do love the sentences you had your son write! It’s a better alternative than taking away video games… my son would just go read a book instead, so he wouldn’t get the message. We do work as a team which is good, because sometimes I will jump to a harsher punishment than is necessary so my husband will reel me back in. Walkie Talkie is a good idea. As our son enters Middle School next year, I’m inclined to want to get him a phone– so that I know I can contact him at all times– but I worry about the responsibility that comes with it. I suppose I could nix the texting completely, but that would be pretty harsh. My husband, by the way, is against the phone idea. Oops, and by the way…..love that you went OLD SCHOOL! Awesome. I got tired of my daughters constant bickering. It seemed to never end. My husband and I wrote up a contract and made them sign it (I do believe that the eldest made a comment as to the level of our intelligence). We talked to them about family, and relationships, and that we intended for them to learn to honor each other and love each other. When they exhibited behavior that was neither loving nor honoring the consequences would be as follows. Rather than separate them, they would be required to spend 24 hours a day together with the exception of school, using the toilet and bathing. During the school day they had to play together at recess, no other friends could be included, and they had to eat lunch together. The oldest would walk the youngest to class, pick her up at the end of the day, walk home, sit side by side to do homework, work a puzzle, eat dinner and so on. If one of them had an activity, the other would go and watch. There would be no outside play dates until they could treat their sibling with love and honor. That was 10 years ago, the contract has traveled with us to 3 continents and it is one of the first things that gets hung up in their bedrooms when we move. We have never had to enforce it (they knew we weren’t kidding) and they have grown to be the best of friends. Love it. We’ve threatened “the contract” before! As a relatively new parent (my kiddo is almost 2), I’m nervous and constantly questioning myself on discipline, especially since she’s entering the dreaded terrible twos phase. I don’t know what the right thing to do is when she’s being “naughty”. The main concern for me is safety. If she is deliberately doing things to harm herself (i.e. – running out into the street, etc. ), it’s black-and-white. However, after that, it gets all gray to me. For instance, how do you teach a 20-month old that throwing food off her high chair is not ideal? At first, I tried explaining that we do not throw food. But she would do it deliberately (looks at me, smiles, and winds her arm back and chunks the food). So, I got to thinking that she needs to pick up her own mess. That’s now starting to help. And of course, there’s time-outs. Since she is only 1, she gets a minute…but boy! You’d think I’d ask her to sit there for an hour! Parenting is hard…tell me it gets easier? I just don’t know if she’s aware of consequences yet. Thank you for the additional links! I don’t have any children yet but I will bookmark this post for when that day comes. Thanks Lori! Thank you so much for sharing this. Our kids are at different stages right now, but I can certainly benefit from your experience. My four-year-old is starting to be willful and take control of situations, which is frustrating to me (I’m finally admitting to myself that I am, in fact, a control freak). One thing I’ve been thinking about lately is that she’s old enough to start participating in setting family rules and consequences. I think that might help her — if she has a say in things. I was concerned about the periods. Glad you made him add them!